Great to see 15 RS Aeros out sharing a regatta with the SZV Class (translates as 'sword pulling bird of prey'!) enjoying a nice force 2-4. This was an exciting milestone for the local fleet to hold their first open regatta at DSCL Frankfurt, one of Germany's main RS Aero locations. Marcus Walther took the win in preparation for the RS Aerocup International Regatta in Lake Garda Italy the following week. Thanks to DSCL Press Officer Michael Kalis for his report. On 17 and 18 September 2016 there was a remarkable premiere for the sailors on the Langener Waldsee. The Dreieich-Segelclub-Langen (DSCL), Frankfurt, was especially pleased to be able to offer this regatta in Hessen. Together with the sword-pulling bird class (SZV), the sailors of the RS Aero class presented themselves for the first time in a regatta here. The Aero is comparable in size to the laser. But much lighter and thus even more sporty and faster. The regatta manager Gert Keppler did a sovereign job. On both regattas a up and down course was sailed. The size of the lake could be well utilized. The wind showed itself well, both days blew between 2 and 4 Beaufort. The direction changed from Saturday to Sunday but without special problems during the races. Thus, in both classes the marked 4 races could be sailed. Three races on Saturday and then one on Sunday. The RS Aero started 15 boats on Saturday. The largest field was provided by the two sailing clubs of Langen WSV and DSCL with six boats. Three boats came from the sailing club Fischlaken Essen - Wer. The other boats came from the Saarland NRW and Offenbach. The first three boats were able to distance themselves clearly from the other places after the two sailing days. 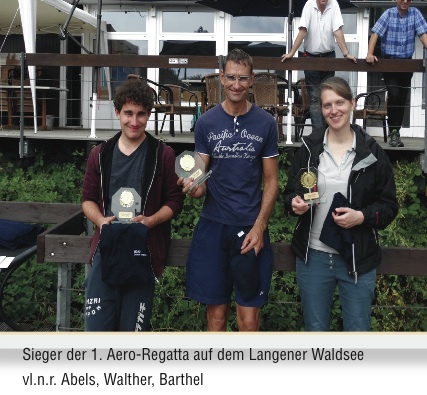 Marcus Walther from the DSCL was delighted about his 3 points score and thus the victory at this regatta, which had been played for the first time in Hessen. The only female sailor Juliane Barthel of the sailing club Dummer reached the second place with 5 points and Jonas Abels from sailing club Bostal was happy with his 8 points to jump on the podium as third. Bester Langener became 4th place, from Livio Duce WSV. The next best sailor of the club DSCL was placed in fifth place, Ingo Albrecht. At the Siegerehrung the race leader Gert Keppler thanked the sailors for the regatta. Norbert Paul from the DSCL, "godfather" for this 1st Aero regatta, thanked all sailors for their show, the kitchen and the regatta team for the great support, which is decisive for the success of a regatta. The animated sailors thanked the organizer with friendly applause.